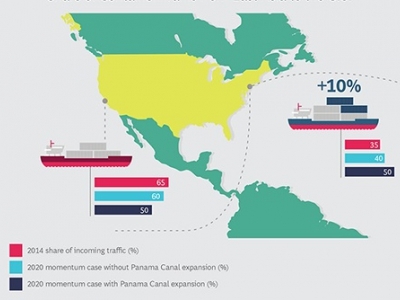 Following the Panama Canal expansion in 2016, up to 10 percent of container traffic to the U.S. from East Asia could shift from West Coast ports to East Coast ports by 2020, according to new research conducted by The Boston Consulting Group (BCG) and C.H. Robinson. Rerouting that volume is equivalent to building a port roughly double the size of the ports in Savannah and Charleston. The research—which involved extensive scenario analyses based on differing levels of demand, capacity, and costs—is believed to be the most comprehensive public study of how the canal’s expansion will likely change the way cargo moves, by both water and land, into and within the U.S. The findings have been released in a report titled Wide Open: How the Panama Canal Is Redrawing the Logistics Map. 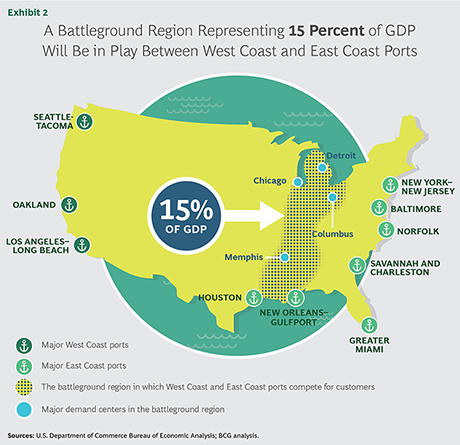 The $5 billion expansion will permanently alter the competitive balance between ports on the East and West coasts. With global container flows rising, West Coast ports will still handle more traffic than they do today, but they will experience lower growth rates and their market share will likely fall. Under any scenario, all major U.S. ports will have greater container traffic in 2020 than they do today. But the largest of the West Coast ports, the Los Angeles-Long Beach complex, will handle less traffic than if the expansion were not to occur. That complex will likely experience growth at an average rate of 5 to 10 percent per year through 2020, compared with double-digit growth rates at some East Coast ports. On the East Coast, the New York–New Jersey port complex and the Southeastern ports of Norfolk, Savannah, and Charleston are well positioned to gain traffic by virtue of their relative proximity to the battleground region and attractive rail routes to major markets. As the East Coast’s largest ports, they are also likely to be on the routes of the post-Panamax vessels, which tend to make fewer, longer stops than smaller vessels.